Brad and Jasmine met while both volunteering for concert service at their church and hit it off during a lull after the opening rush. She gave him her number on the back of a concert flyer that they still have to this day, and he quickly asked her to coffee so they could get to know each other better. It turned out they found mutual appreciation in each other for their services to God, and she appreciated Brad’s straightforwardness from the get-go. Two weeks later on Sunday, November 20th, Brad asked Jasmine’s dad for permission to date her. Brad proposed to Jasmine at a local park, under the guise of getting outdoors to read a book they both were studying. When the moment felt right to pull out the ring he proposed on one knee, along with a personalized Bible. Her friends and a photographer were hiding nearby and ran out to capture the moment on film. Later after dinner, Brad surprised her again by dropping her off to another surprise with friends and family hidden at her place to congratulate her again. Jasmine always knew she wanted a destination wedding, and said, “I always had this dream since I was little.” She cites that Brad was very willing to let her have her dream. They knew friends and family members who had hosted their own destination weddings, and they were very encouraging. Jasmine loves traveling and adventure, and with hosting their wedding abroad they would get to bring everyone on the adventure with them. 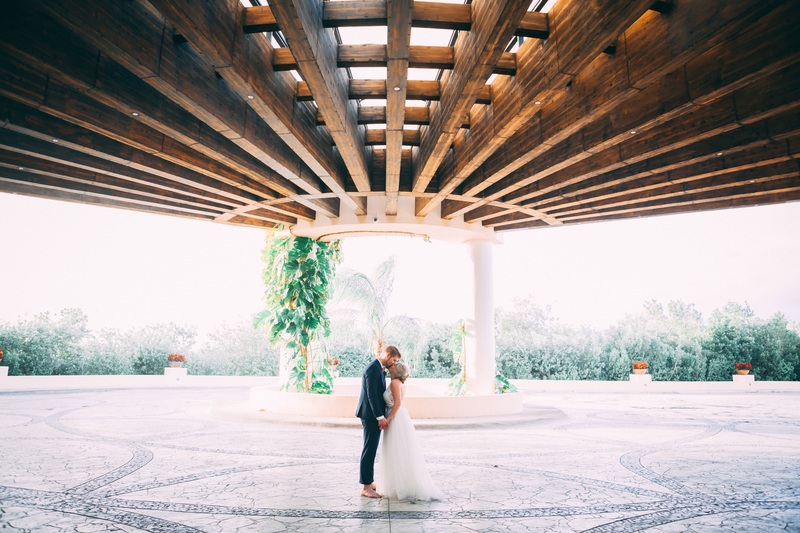 After researching on her own Jasmine became overwhelmed with planning, especially when considering coordinating travel for the guests and finding the perfect beach ceremony venue that would also host the reception. She stumbled upon Destify through Pinterest and with their agent Andrea they chose from a number of resorts and selected the NOW Jade in Cancun, Mexico. Andrea helped arrange all of the travel and accommodations for their guests. Although communication was hard at first via email with the wedding department, once on-site the couple said the coordinator was extremely sweet and helpful. Brad and Jasmine stayed in separate rooms with siblings the night before the wedding, and up until the moment of the reveal. Jasmine took her time in the morning, ordering in breakfast before heading to the salon for hair and makeup. Funnily enough, she finished early and got to sit back and relax while the rest of the bridesmaids and mothers frantically got ready. Brad spent the day having brunch, arranging excursion details and getting ready with his groomsmen. Both parties got to take pictures with their families before the ceremony. They brought their own pastor, photographer, and videographer for their wedding. After their beautiful beach ceremony, they hosted a cocktail hour in the garden which unfortunately experienced a light 5-minute downpour, leaving guests running for cover. Luckily their beach reception was unaffected, and it featured everything from extra lighting to a light-up dancefloor. In reflection, the couple recommends getting started as early as you can, they felt limited with the short amount of time they had to plan. They also recommend checking with the resorts and their abilities to take large groups on the spot at restaurants if they don’t take reservations. They also saved money by getting some great room comps from their guests booking early and by bringing their own suitcase with their own decor and centerpieces. I’d recommend having a day to yourself before the ceremony, just to relax before guests arrive.